The Vibrapod Isolators are black vinyl feet for HiFi components such as CD players, turntables, amplifiers, preamps and also loudspeakers and video components. Considered that Stereophile awarded the Vibrapod Isolators with the Recommended Component award last October ('98) and that many US HiFi reviewers consider these apparently simple devices an absolute bargain, I was very interested to put them under test. I've tried many similar tricks, tip toes, cones, graphite blocks, rubber feet of various shapes and sizes, including even some micro air-suspended door-stoppers that work incredibly well (alas, available in Italy only) so I'm well aware of the difference this kind of devices can make. The main idea behind these devices is well-known: vibrations and resonancies can affect the performance of ANY HiFi component so heavily that it is a shame that HiFi Designers still ignore the problem, considering the low quality of the OEM feet that they put under their hi-$$$ components. The Vibrapod Isolators are as simple as they appear in the picture above: soft feet designed to replace the original stock ones. They come in 4 different models, Model 1 being the softer and Model 4 the stiffer one. They should dampen the vibrations both on the vertical and horizontal plane and they should be placed directly under the cabinet of the choosen component, for example, in number of 3 along each side (front, rear, left side, right side), NOTHING in the center. You're free to use the # of Isolators you want (even as low as 3). For example, using 8 (3 on each side) units of the Model 1 you can easily isolate any HiFi component up to 14 kgs, more or less. For heavier units you should choose one of the stiffer Isolators. I've even tried just 4 Isolators per unit and found them to work pretty well. You can use the Pods both as shown in the picture above or upside down. For turntables it could be useful to build a sandwich consisting of two MDF or glass shelves coupled with a reasonable number of Vibrapod Isolators. I hope you all know this album from the famous Black Sabbath rock band. Masters of reality (actually, Master of reality is the real title of their '71 album) is the first thing that came to my mind when I first put my hands on the Vibrapod Isolators. Why? Well, just because these devices appear very simple, down-to-earth, no voodoo-science designs, built to work in a real world. I've tested them under a large variety of HiFi components, ranging from cheap to expensive CD players, transports, DACs, turntables, tube and solid state preamps and power amps, small and huge loudspeakers. First of all let me say that, when used as a replacement of the stock feet, the Vibrapod Isolators work very well: if you need a proof that HiFi designers are dead wrong when they ignore the importance of proper vibration isolation, just place a set of Pods under ANY commercial HiFi component. If you have never tried to replace the stock feet you'll be amazed by the results: the difference is so evident that you'll feel embarassed to confess to have spent hundreds of $$$ on expensive interconnects...disregarding the importance of the isolation of your HiFi components. You'll experience a clear improvement of the overall performance of the *treated* unit: deeper and *rounder* bass (result: electric bass lines become easier to *follow*), cleaner midrange and sweeter highs. Not to mention the increased precision and focus of the image and the overall sense of smooth and sweet musicality. One gets the feeling as the level of distortion has decreased so that the listening experience becomes much more enjoyable and relaxing. Some HiFi component benefits more than others of the Vibrapod effect: CD players, turntables and tube equipped electronics, for example, seem to like this treatment a lot. With loudspeakers and solid state amps the effect may vary WILDLY from component to component. What I'd like to point out is: ANY anti-vibration coupling/decoupling device works differently depending on the treated component: you may have experienced this when using cones and tip toes. And the Vibrapod Isolators make no exception, though they seem much less hysteric with respect to critical partnership. I've found them to work well with almost any component, you just need to pay extra attention when testing them under heavy loudspeakers and massive solid state power amps since here pops up another WILD variable to consider: the effect and the response of the floor. To put this simpler: if your floor is springy and elastic (wood, for example) avoid tip toes like the plague and try the Vibrapod Isolators instead. If your floor is stiff (marble, for example) cones may work better. Please consider that it strongly depends also on the kind of cabinet of the unit (loudspeaker or amp)...each situation should be verified case by case carefully. With small and lightweight loudspeakers the Vibrapod Isolators may help you to re-discover the lost concept of musicality, traded in favour of clinical precision by means of dozens of pointed cones here and there. Roughly speaking, if your HiFi system is coupled to the outside world by means of tip toes and cones ONLY, I strongly suggest to test some set of Vibrapod Isolators...you may come back to Music listening for hours and hours. I've already explained how to use them. Here is some no-no: avoid putting the Pods in a close triangular scheme and be sure they don't touch each other. Carefully place them so that only the cabinet touches them: if in doubt, unmount the old stock feet. The Owner's manual suggests, if possible, to use them even directly under the stock feet but, in my experience, this may degrade the performance of the Pods. What should you do if your HiFi component is heavier on one side only (because of a massive transformer, for example)? Easy: place a stiffer foot under that area and you're done. What to do if your Pods lose their original shape because of a wrong placement? Don't fret: put them into an oven (NOT microwave) at 90 C (175-200 F) for 10 minutes then wait till they have cooled. If your wife doesn't like the idea of putting non-edible :-) stuff into the same oven where she cooks her wonderful cakes, well you can use even an hot air drier as well. The Vibrapod Isolators come with a hole in the center, so they can be easily installed with the same screws used to hold in place the old stock feet. I've found they work equally well even if not screwed into the unit. Not much to say here just let me repeat the previous caveat: there's no such a thing as an UNIVERSAL device that works equally well in every situation. The Vibrapod Isolators are among the less critical such devices I've ever tried but, in certain situations, they may not work. Ask them for a listening test: a nice 30-days money back guarantee will refund your cash if you'll find the devices not to work well with your components/set-up. Another small complaint is related to the height of these devices: they are pretty low so that testing them without unmounting the original feet may result in a quite difficult task (some OEM feet are taller than the Pods). Also, because of the reduced height, some unit that works at high temperatures (power amps, tube equipped devices) may suffer overheating problems. I guess the height of the Isolators is crucial for their performance so this last complaint may result totally useless. If the height isn't crucial I'd humbly suggest to considering making them slightly taller. Of course, you can always build a Vibrapod sandwich as explained above but, in my experience, MDF or glass shelves may add something of their own to the performance of the Isolators. These Vibrapod Isolators work extremely well and they can add a plus of musicality to any dead-sounding too-many-tip-toes-equipped HiFi set-up. 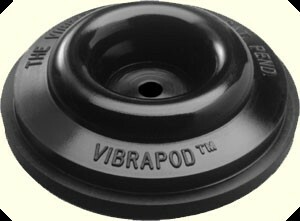 Considering the way they work, their low price and the fact that the 10% of all sales is donated to outreach organizations I consider the Vibrapod Isolators one of the best HiFi devices I know. They can bring you back to Reality in a snap. Forget all that stupid voodoo-science others may have told you and test drive a set of Vibrapod Isolators: your ears will definitely thank you. Finally I officially invite all the HiFi designers that are reading this article to seriously consider using the Vibrapod Isolators as stock OEM feet under their HiFi components. Contact Sam Kennard, the man behind the Vibrapod idea, another living proof that behind good sounding components there is always a clever designer. A HUGE thank you to Sam Kennard, owner of the Vibrapod Company, for having sent us these devices for this listening test.